How many of you grew up watching the television cartoon Count Duckula with his mad nanny, evil butler and time travelling castle? It was one of those cartoons that were so darn funny and kept me engaged for a really long time. Just thought I’d share that rather poignant childhood memory with you. But since we are speaking of ducks (see what I did there? ), I will also share with you my love of all things that go “Quack”. Growing up in Malaysia, we were definitely exposed to quite a lot of cuisines. Even in Chinese cuisine itself, there were that many different ethnic variations to the cooking styles from each province that we never had a shortage of things we would like to eat. One such Chinese cuisine which I do miss is Teo Chew styled food. 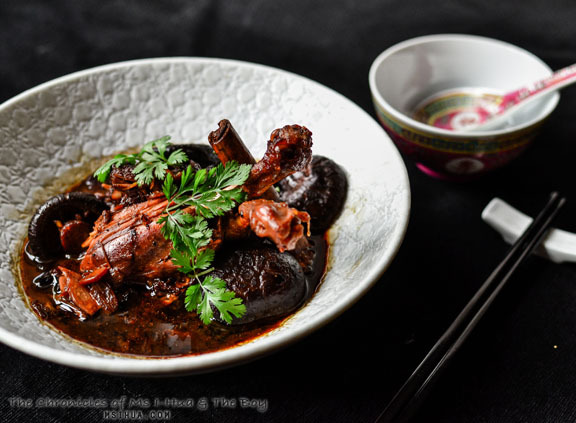 Especially the many different types of ducks in the Teo Chew style of cooking. It’s a good thing I married a pure Teo Chew boy 🙂 What I crave, he is able to replicate! One day, The Boy decided to surprise me with this dish. It’s a dish that instantly brought back images of home and eating together with our own respective family around the table. 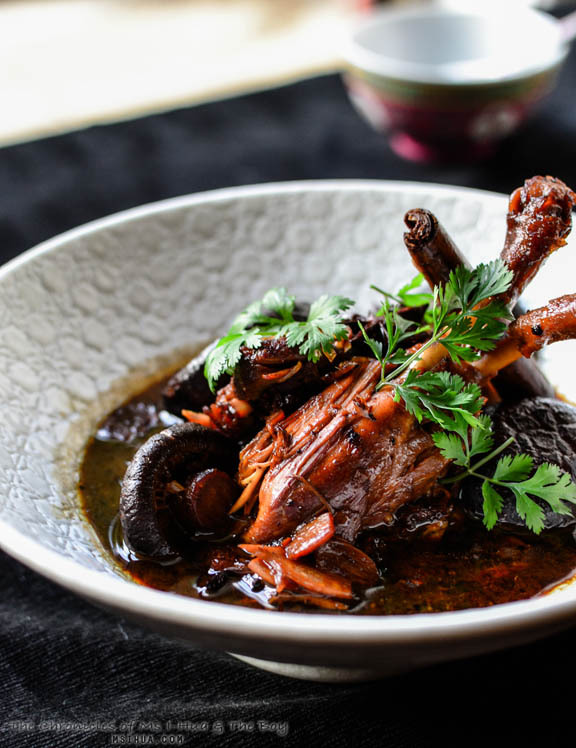 Enjoy this simple, but very delicious Teochew Style Braised Duck. Heat oil in a Dutch oven or a thick-bottomed pot (enough to fit the pieces of duck). Add duck and brown the sides of each piece. Remove and set aside. Drain rendered fat* from the Dutch oven/pot leaving 1 to 2 tablespoons of fat to fry the rest of the ingredients. Fry garlic cloves and ginger on medium heat in the Dutch oven/pot until fragrant. Add in five spice powder, Gula Melaka, light soy sauce, thick dark soy sauce and oyster sauce and stir the mixture around for a few seconds. Add in the browned meat and stir around in the mixture for 2-3 minutes. Add in all other ingredients (Shiitake mushrooms, star anise, cinnamon stick, ground black pepper and water). Ensure that the liquid fully covers the duck. Once the liquid reaches to a boil, turn down the heat and cover the Dutch oven/pot. Let it simmer for 1.5 to 2 hours until meat is falling off the bone. Best served with a bowl of congee or steamed rice. *Note: Reserved duck fat can be used for frying potatoes. Optional: You can strain the liquid and reduce it to a thicker sauce if desired. This is definitely a darker version than I am used to but the taste induced quite a lot of “Oh, my Goodness!” and excited squeals around the table when I tasted it. It was just so damn tasty and the meat was falling off the bone. Best to have this on a cold rainy day and let the warmth and homey goodness of the dish sooth your soul. Also, what other cartoons do you remember watching as you were growing up? 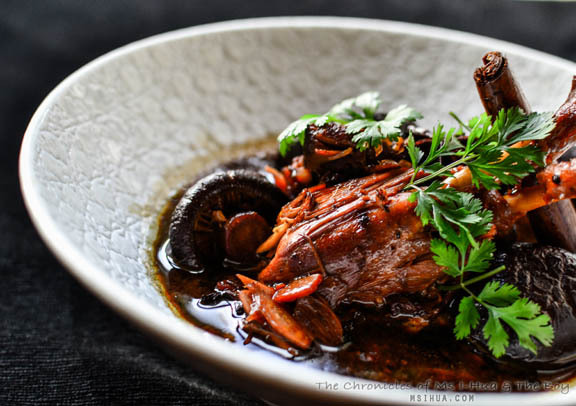 Nor have I had teochew style braised duck before but would love to try! Aww kids can be so terrible can’t they? I do love Disney though! There’s an error in your recipe. omg this sounds amazing. And I’d totally be hogging all that delicious sauce for my rice! That’s exactly what I did! Love sauce! Oh yum!!! Looks really really good. Bookmarked the recipe already gonna try it soon!! Then I’ll be eating the quack quack with lots of rice and the “chap” hehe. Roasting duck is soooooo difficult! Duck is such a crazy thing to cook, but braising it is so simple! I’m not sure if it’s a good thing or a bad that I knew exactly what you were talking about in the first paragraph! Ooh Danger Mouse.. and Mighty Mouse.. I have not seen Roger Ramjett! Must youtube!